2 years, 11 months, 30 days | How Do You Do It? Tomorrow, my babies turn three. This is mind-blowing in any number of ways, of course. 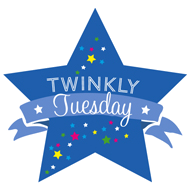 But looking back on this blog, which I started back when they were six months old, one thing that really strikes me is how much the “twin thing” has changed over the last three years. 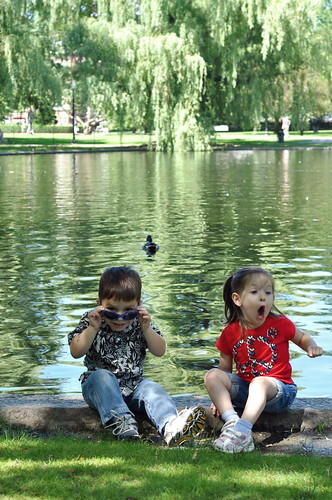 The last 12 months, the centrality of their twin-ness to my parenting experience has really faded into the background. Oh, it’s still a major factor of my identity as a mom, don’t get me wrong. I will always carry that as a badge of pride, maybe as a war wound, too. I love that my kids are twins. While they may not be as inseparable as some, they are most definitely close. They fight, sure. They get on each other’s nerves in ways I find both exhausting and amusing. But the last year in particular, they really have become each other’s very best playmates and have tons of fun together. 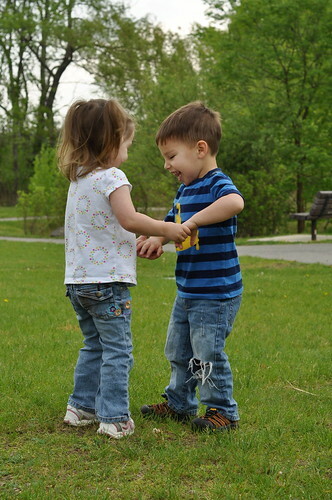 With almost no words spoken between them, a piece of rope will turn into a 20-minute game of chasing and hysterical shrieking. While there will always be benefits and problems that are specific to having twins, my day-to-day life is no longer a series of unique logistical problems in the way it was that first 3, 6, 12, 18 months. Having twin newborns, infants, and young toddlers is so intense and so uniquely challenging, it makes for an entirely different experience of parenting from those who have “just” one. People are incredulous when they ask “how do you do it?”, especially because if we parented just like a singleton-parent-times-two, we’d never make it. We don’t fuss over every little thing, we simply don’t have the time. That experience is foreign to us. Today, though, I don’t think my life as a parent of two three-year-olds is nearly so different from my friend with the two-year-old and four-year-old. 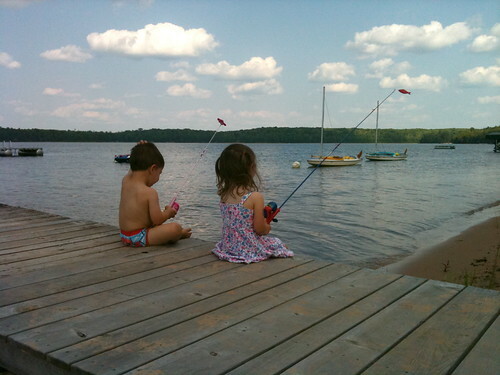 Much more these days, I’m simply a parent of two children. 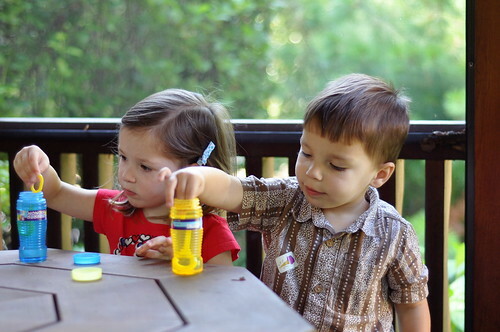 When people start to give the, “oh, wow, twins, that must be so hard!” reaction, they now start to backtrack and realize that it’s not so different from their life as a parent of two, even if they had them one at a time. The intense difficulty of those first months has not been negated. It forever changed me, primarily in what I think are really positive ways (even if that was in a “whatever doesn’t kill you makes you stronger” kind of way). My kids and their twin-ness will always have something special that their singleton friends don’t. I will always proudly be a Mom of Twins. But I’m also just a mom of two kids, like so many others. The specialness of my experience is fading a little bit, I’m blending in. I’m OK with that. I’ll never forget where I came from. The ability to self-soothe begins to emerge around 61 months. Happy birthday to your sweet kids! I kind of feel the opposite of you. My boys are almost three, and are being a bit more challenging of late. The fact that there are three of them, in the throes of what is simply “being two” is overwhelming to me, more so than having three newborns or three one year olds. Or maybe I’ve just forgotten those days. Happy birthday to your kids! Mine have just turned 1 now and I’m just about starting to see the light…… looking forward to 3, I can tell you that! I love this post because it word for word represents what I feel being a Mom of twin girls. Mine are now four years old, but them being twins at this age are not nearly as challenging as when they were babies and toddlers. So glad to hear there is light at the end of the tunnel!! Mary recently posted My very first GIVEAWAY!!! I know what you mean! That is when I felt like I was ready to stop writing here. Didn’t have much twin “stuff” to write about. I may need some cathartic guest posts when my boys go to kindergarten in TWELVE MONTHS and are separated. I hope you all have a great time celebrating their 3rd birthday tomorrow! We’re also feeling more and more like the parents of two kids than the parents of twins. Of course, the twin thing is always there, but as they develop more as individuals, it’s becoming less prominent. Just wanted to write and say how much I love this blog. I’m still in the beginning of all this – my twin girls are just six months old – but it’s so nice to read about other’s experiences and feel that I’m not so alone as I go through all of this. I love reading what I get to look forward to as well. I can tell it’s going to be quite an adventure! Happy Birthday to your little ones. Our girls are just starting to walk and have stopped breastfeeding, and it seems things are getting easier! Glad to know that will continue. Thank you for your postings, and this blog. Happy birthday to your two as well! My girls turned 2 in May, and this blog has been so immensely helpful to me. I have even bookmarked certain posts, knowing that I will need to refer to them in the future (potty training coming to mind right now). I also know what you mean in that things are becoming a little less high stress around here. With a busy job that is part time, and then taking care of the girls, and not being all that social, I haven’t joined any mom’s groups, and so the support here has been much appreciated. 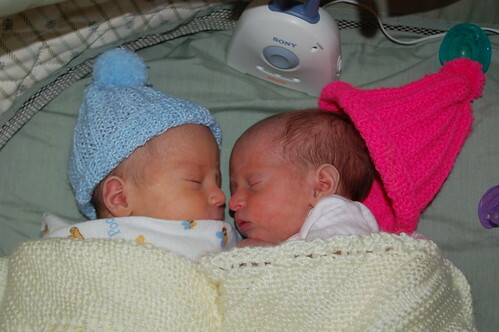 My twin boys are only 14 weeks old but it’s nice to hear from people who have twins. It’s always great to hear from people that are going through the samethings you are. I have a 3.5 year old girl as well and I think she is more work than the twins right now. I really lucked out they are awesome babies. I must say I hope 3 is better for the boys than it has been for my daughter. 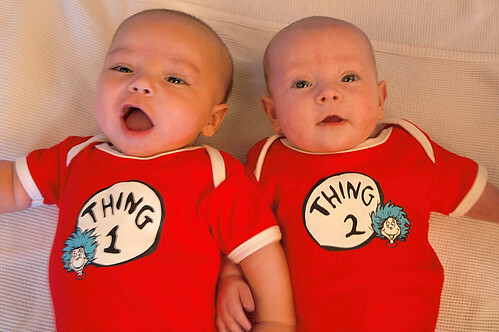 Also, I love the thing 1 and thing2 shirts. They are great! Happy Birthday to the kiddos! Thank you. This said so much of what I’ve been feeling. We’re at 15 months and most days it feels like I’m a referee. Previous Previous post: Ironic- don't ya think? Next Next post: Oh yeah, they're a riot.